Yesterday Fabiano Caruana, America's youngest grandmaster, turned 15 years of age. 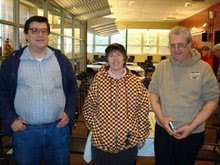 The 2007 United States Open chess tournament is underway in Cherry Hill, New Jersey. There was a game/30 Swiss today, in which I finished 2-1-2, at the Marshall Chess Club. The following were my best efforts. 15.b4 c5 16.Rh3 cxb4 17.axb4 Bxd5 18.cxd5 Rc8 19.Qd4 d6 20.e6 fxe6 21.dxe6 Nc6 22.Bxh7+ Kh8 23.Qe4 d5 24.Qxd5 Qxb4+ 25.Kf1 Qa5 26.Qe4 Qa1+ 27.Ne1 Ne5 28.f4 Rc1 29.fxe5 Rxe1+ 30.Kf2 Rf1+ 31.Kg3 Qe1+ 32.Kg4 Qd1+ 33.Kg5 Qd8+ 34.Kg4 Qd1+ 35.Kg5 Qd8+, draw. 16.Bxd7 Nxd7 17.Bf4 Qc5 18.Nf5 Qxd5 19.Qxd5 Bxd5 20.Bxd6 Rfe8 21.Bxb4 Nf6 22.Bc3 Rad8 23.a3 Be4 24.Bxf6 gxf6 25.Ne3 Rd2 26.Rad1 Red8 27.Rxd2 Rxd2 28.Rc1 f5 29.Nf1 Rxc2 30.Rxc2 Bxc2 31.Ne3 Bb1 32.b4 Bd3 33.f4 Kg7 34.Kf2 Be4 35.g3 Kf6 36.Ke2 Ke6 37.Kd2 Kd6 38.Kc3 f6 39.Kd4 h5 40.h3 Kc6 41.g4 hxg4 42.hxg4 Kb5 43.gxf5 Bb1 44.Nd5 Kc6 45.Nxf6 Bxf5 46.Nd5 Kb5 47.Nc3+ Kc6 48.Ke5 Bh3 49.a4 Bf1 50.f5 Bc4 51.Kf6 Kd7 52.b5 axb5 53.axb5 Kc7 54.Ke7, Black resigns. Congratulations to newly-elected USCF Executive Board member Paul Truong! Recently I played this game against Truong in a game/30 quad at the Polgar Chess Center, run by grandmaster Susan Polgar who also was elected to the Executive Board. Usually Black plays ...e6 before bringing the bishop to b7. 8.f3 Nbd7 9.Be3 Nc5 10.Qd2 e6 11.O-O-O Rc8 12.Kb1 Be7 13.g4 Nxb3 14.axb3?! d5! White should have captured with 14.Nxb3 to restrain this move. In the game, Black could have been slightly better by 16...b4. 22.h4 Rf5 23.Rd3 g6 24.Rh1 Rc8 25.c3 Rcc5 26.b4 Rc4 27.b3 Rc7 28.Kb2 Kg7 29.Ra1 Nf4 30.Nxf4 Rxf4, draw. A likely conclusion might have been 31.Rxa6 Rxh4 32.Rb6 Rh2+ 33.Kb1 Ra7 34.Rxb5 Rh2+ 35.Kb1 Rh1+ with a repetition of position. How about this for a "man bites dog" story? Although computers have surpassed humans at chess, checkers, and backgammon, we still have the upper hand when it comes to poker. Ordinarily I would not post a victory against an eight-year-old kid. But when he later becomes America's youngest grandmaster, I make an exception. This Philidor Counter Gambit was played at the Marshall Chess Club. The time control was game/60. In light of White's next move, it may have been better for Black to interpolate 6...f4 before retreating with 7...Nb8. Worthy of consideration is 8...Ng4!?. 9.Qd2 Nf5 10.h3 e3 11.Qd3 e2 12.Re1 h6 13.hxg4 hxg5 14.Qxf5 c6 15.dxc6?? White wins easily after 15.Qg6+. This forgettable game makes both players look bad: me, for getting outplayed in my favorite defense; and Caruana, for allowing a swindle in a winning position. The 2007 United States Open chess tournament begins this Saturday, July 28th, at the Crowne Plaza in Cherry Hill. At this year's U.S. 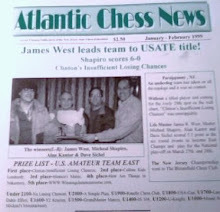 Amateur Team East tournament, Atlantic Chess News editor Steve Ferrero won in round two with the Philidor Counter Gambit. Ferrero was my teammate and captain on Insufficient Losing Chances. Actually, the game started out as a Latvian Gambit before transposing into the PCG. Ferrero avoids the complications following 5...d5 6.Nxe5 or 6.Neg5. Another line, giving White a slight plus, is 9.Bc4+ Kh8 10.Nxf6 Nc6 11.Qe4 Bxf6 12.h4. Perhaps White has a tiny advantage in this position. Now the position is equal. But, after White's next move, it is Black who stands slightly better. 31.Re4?! Rf8 32.Ne6 Rf2 33.Rd4? White needed to play 33.Re2, relying on 33...Rxe2 34.Nf4+ followed by 35.Nxe2. Black has a clear advantage. 38.g3 Kf5 39.Ng7+ Kg4 40.h3+ Kxg3 41.Nxh5+ Kxh3 42.Ng7 Kg4 43.Ne6 Kf5 44.Nd4+ Ke4 45.Nc2 d5+ 46.Kc5 Kd3 47.Nd4 Kxc3 48.Nxc6 d4, White resigns. Here an international master outplays a grandmaster in a rook-and-minor-piece ending, from round six of the New Jersey Futurity International 2007. Eighth move alternatives for White include 8.Qa4, 8.Bb5, and 8.Bd3. The position is similar to the exchange variation of the Caro-Kann. Black should have swapped bishops by 10...Bxe2 11.Qxe2 before exchanging on e5. Black would like to start a minority attack, but 16...b5? loses a pawn to 17.Bxb5. Now both players have a weak center pawn. 27.Re2 Re5 28.Kg1 Ke7 29.Kf2 Nd7 30.g4 h5 31.Bc2 Nf6 32.Kf3 Kd6 33.Rd2 g6 34.Rd4 Nh7 35.gxh5 Rxh5 36.h4 Nf8? Black should have played 36...Nf6 with an equal position. Now White forces a winning rook-and-pawn endgame. 42.Bxg6! Ne5+ 43.Kg3 Nxg6 44.Rf6+ Kd7 45.Rxg6 Rxd5 46.Rg7+ Kc6 47.Rf7 Rd8 48.h5, Black resigns. Computers have already surpassed human opponents at chess, checkers, and backgammon. Now they are trying their hand at poker. 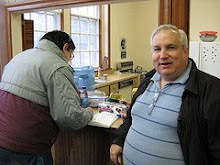 At today's game/30 Swiss in Cherry Hill, I finished with a record of 1-1-3. Two of my draws were as Black against masters. 18.c3 Qg5 19.f4 Qh6 20.Qc2 Rf8 21.Qd2 Rf7 22.Qe3 Rb8 23.b3 Rbf8 24.g3 Bh3 25.Rfe1 Qg6 26.Bf1 Qe6 27.Bg2 g5 28.Rf1 gxf4 29.Rxf4 Rxf4 30.gxf4 Bxg2 31.Kxg2 Qg4+ 32.Qg3 Rxf4 33.Rf1 Qxg3+ 34.hxg3 Rxf1 35.Kxf1 Kf7 36.Ke2 Ke6 37.Ke3 Kf5 38.c4 dxc4 39.bxc4 h5 40.a4 a5 41.c5 d5 42.Kf2 Ke6 43.Ke3 Kf5 44.Kf2, draw. 18.c4 Qa5 19.Bc2 Nc5 20.Nb3 Qxa4 21.Nxc5 Qxa2 22.Bb3 Qa5 23.Nxb7 Kxb7 24.e5 Rd8 25.Qf3+ Kb6 26.g3 dxe5 27.Rxe5 Qa1+ 28.Kc2 Qxd1+ 29.Qxd1 Rxd1 30.Kxd1 Bf6 31.Rh5 Bxb2 32.Kc2 Bc3 33.Ba4 f5 34.Rh6 Rg6 35.Rxh7 e5 36.fxe5 Bxe5 37.Rf7 Rf6 38.Rxf6+ Bxf6 39.Bd7 Kc5 40.Kb3 a5 41.Be6 Be5 42.Bxf5 a4+ 43.Kxa4 Kxc4 44.Be6+ Kc3 45.Bf7 Bd6 46.Kb5 Kd4 47.Kc6 Be5 48.Bg6 Ke3 49.Kd5 Bxg3 50.hxg3 Kf3, draw. A computer program Chinook has solved the game of checkers. With proper play, the game should end in a draw. It took Chinook eighteen years to arrive at this conclusion. 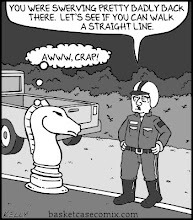 There is no need for chess players to worry. It would take eons for computers to solve chess. 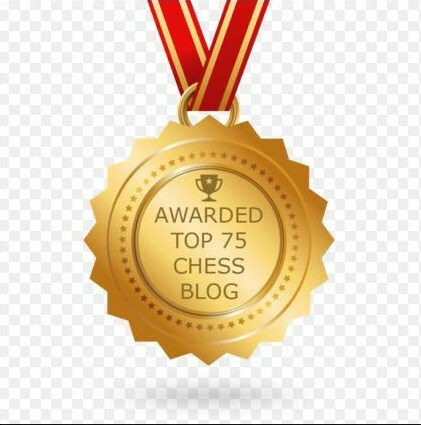 In recent days, two of my blog posts have received mention by Mark Weeks in his review of chess blogs from the month of June. The first was USCF Executive Board Election. 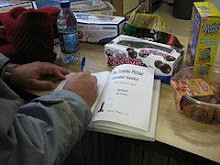 And the second was Michael Goeller Interviews Me. I would like to correct an error. In the interview, I mistakenly told Goeller that Ken Potts was the New Jersey state champion in 1985. 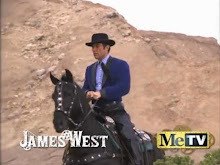 According to the NJSCF website, it was actually Orest Popovych. Ken Potts won the title in 1980. My memory is good, but short! 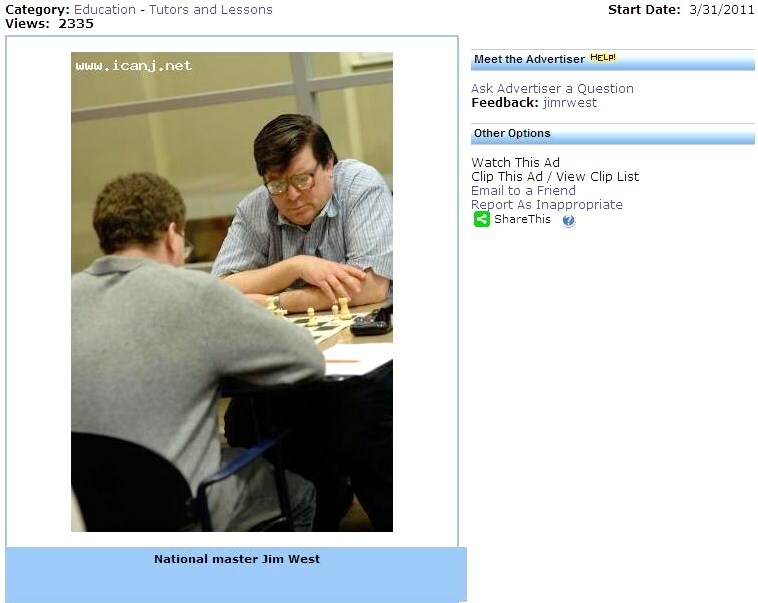 International master Dean Ippolito earns his living as a chess teacher. 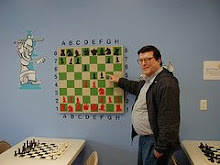 Here Ippolito gives a lesson in tactical chess, from round two of the New Jersey Futurity International 2007. In hindsight, it may have been better to develop the other rook with 12.Rfd1 Bxg2 13.Kxg2, as in Kavalek-Ghinda, Bochum 1981 which White won in 43 moves. 12...Bh6 13.Qe1 Ne5 14.Nd5 Nfg4? Correct for Black is 14...Nxd5 with an equal position. 15.Nxe7+ Kg7 16.Rxd6 f6 17.Nh4 Bxg2 18.Kxg2 Rae8 19.h3 Rxe7 20.hxg4 Nxg4 21.Rd5 Re5 22.Rd7+ Kh8 23.Bxe5 fxe5 24.Qb4?! This move lets Black off the hook. After 24.Rxb7, White has an easy win. 24...Ne3+! 25.Kg1 Qxe2 26.Qxf8+ Bxf8 27.fxe3 Bc5 28.Rff7 Qxe3+?! Now it is Black's turn to go wrong. He should have played the simple 28...Kg8 when a drawn ending results from 29.Ng2 Bxe3+ 30.Nxe3 Qxe3+. 29.Kg2 Qg1+ 30.Kf3 Qe3+ 31.Kg4 Qe4+ 32.Kh3 Qh1+ 33.Kg4 Qe4+ 34.Kg5 Kg8 35.Rg7+ Kh8 36.Rxh7+, Black resigns. It has been a very good year for FIDE master Tommy Bartell. Before the New Jersey Futurity International 2007, he had already beaten grandmasters Yudasin (USATE) and Shulman (World Open). 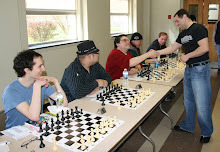 Here he defeats one more grandmaster in round eight of the Parsippany event. 1.Nf3 d5 2.g3 Nf6 3.Bg2 c5 4.0-0 Nc6 5.d4 Bf5 6.b3 e6 7.Bb2 cxd4 8.Nxd4 Be4!? Although there is nothing wrong with this move, it seems ill-advised in light of what follows. White's knight keeps moving around aimlessly, trying to find a good square. Black should have pushed this pawn one move earlier. Instead, White could have obtained a huge advantage by 33.exd4 Rxd4 34.fxe6 fxe6 35.c5! 33...Qe7 34.fxe6 fxe6 35.exd4 Rxd4 36.Re2 Rh4 37.Rg4 Rf8 38.Qg3 Rxg4 39.Qxg4 Rf4 40.Qg3 Qf6 41.Nc3 Bh4 42.Qd3 Rf3 43.Re3 Rxf2 44.Nd1 Rd2, White resigns. The brilliancy prize at the New Jersey Futurity International 2007 was awarded to Mackenzie Molner for winning the following game in round four. 1.c4 e5 2.g3 Nf6 3.Bg2 c6 4.Nf3 e4 5.Nd4 d5 6.cxd5 Qxd5 7.Nc2 Qh5 8.h3 Qg6 9.Nc3 Bd6 10.Ne3 0-0 11.Qc2 Re8 12.b3 Na6 13.a3 Nc7 14.Bb2?! Zlotnikov should have chased the dark-squared bishop with 14.Nc4 Bf8, as in Johansen-Steedman, Norwegian Championship 2006, won by White in 40 moves. This move loses, but it is difficult to suggest anything better as 16.O-O-O runs into 16...Bf5, 17...Rfc8, and 18...b5. 16...Bxg3! 17.fxg3 Qxg3+ 18.Kf1 e3 19.dxe3 Ne4 20.Bxe4 Rxe4 21.Bd4 Bxh3+ 22.Rxh3 Qxh3+ 23.Ke1 Qh1+ 24.Kf2 Qh2+ 25.Kf1 Rxd4, White resigns. After 26.exd4 Qh1+ 27.Kf2 Qxa1, Black will be up an exchange and a pawn. This game was played earlier today in a game/30 Swiss at the Marshall Chess Club. 17.a3 Qg5 18.f3 Rxc1 19.Qxc1 Rc8 20.Qe1 h5 21.Qe2 h4 22.Kh1 h3 23.gxh3 Re8 24.e4 Rc8 25.Rg1 Rc1 26.Rxc1 Qxc1+ 27.Kg2 Qg5+ 28.Kf2 Qh4+ 29.Kg2 Qg5+ 30.Kf2 Qh4+, draw. 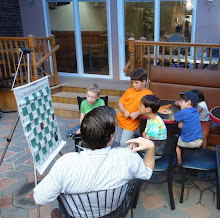 At today's Hamilton Chess Club Quads, I competed in quad one where I finished at 1-1-1. The following is my best game. 14.Nc4 dxc4 15.d5 Qa6 16.dxc6 Qxc6 17.Nd4 Qd5 18.Qa4+ Kf8 19.Bh6+ Kg8 20.Qd1 Nf6 21.f3 Bf8 22.Qd2 Ne8 23.Qg5+ Bg7 24.f4 Qd8 25.Qg3 Qf6 26.Bg5 Qg6 27.Qf3 Nd6 28.Nc6 Bf8 29.Ne5 Qg7 30.Nd7 Ne4 31.Rxe4 fxe4 32.Qxe4 f6 33.Qxe6+ Qf7 34.Nxf6+ Kg7 35.Bh6+ Kg6 36.f5+ Kxh6 37.Qxf7 Bc5+ 38.Kh1 Raf8 39.Qh5+ Kg7 40.Nd7, Black resigns. At the recently completed New Jersey Futurity International, current NJ state champion Evan Ju and former NJ state champion Tommy Bartell just missed norms for international master. This game, played yesterday, won the biggest upset prize at the New Jersey Futurity International in Parsippany. 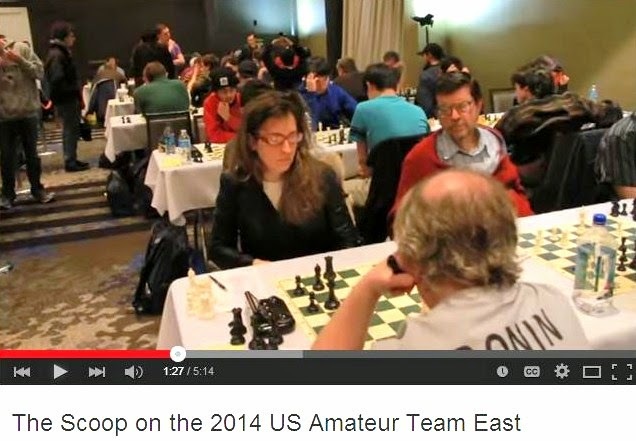 The player of the white pieces is New Jersey state champion Evan Ju. White usually plays 12.O-O-O in this position. Black should have played 13...Qa5+ 14.c3 Rg8 15.Rd1 Bc6 with 16...Rd8 to follow. This is a winning position for White. Simplest is 19.Qxa5, preferred by Fritz8. Ju's continuation is also good enough. 19.Qh4 Bxb2 20.Rd3 Qc1+ 21.Bd1 Rg8 22.Rf1 Be8 23.Nxc8 Rxg2 24.Qd8 Rxc2 25.Qd6+ Kg7 26.Rg1+, Black resigns. Today is the final day in the New Jersey Futurity International, taking place at the Sheraton Hotel in Parsippany. Originally scheduled for July 21st, this month's Hamilton Chess Club Quads have been moved forward one week to July 14th. Chess in Raymond Chandler's "The High Window"
Chess is a literary motif in Raymond Chandler's The High Window which features detective Philip Marlowe. It was night. I went home and put my old house clothes on and set the chessmen out and mixed a drink and played over another Capablanca. It went forty-nine moves. Beautiful and remorseless chess, almost creepy in its silent implacability. When it was done I listened at the open window for a while and smelled the night. Then I carried my glass out to the kitchen, and rinsed it and filled it with ice water and stood at the sink sipping it and looking at my face in the mirror. Chess in Rex Stout's "Gambit"
Those of you who enjoy a good murder mystery, as well as chess, should consider getting hold of Rex Stout's Gambit which features the famous armchair detective Nero Wolfe and his sidekick Archie Goodwin. It is obvious to me that the Gambit Club is a fictionalized version of the Marshall Chess Club. This is Archie Goodwin giving directions on how to get there: Headed south on Sixth Avenue....I kept going, clear to Twelfth Street, turned left, stopped half way down the long block, and focused on a four-story brick building....A brass plate to the right of the door, nice and shiny, said Gambit Club. Except for the fact that Sixth Avenue is now known as Avenue of the Americas, if Archie Goodwin had turned left on Tenth Street (instead of Twelfth Street) he would have arrived at the Marshall Chess Club! Today I competed in a game/45 Swiss at the Marshall Chess Club where I finished with a record of 3-1-1. My only loss came to the birthday boy, international master Jay Bonin, who received his present from me when I hung a piece. Here are my three victories. 17.Nc4 Ng4 18.Rd2 b5 19.Ne3 Nxe3 20.fxe3 Nd5 21.Re2 Bg4 22.Ree1 Rf8 23.h3 Bh5 24.g4 Bg6 25.Kd2 Rf3 26.a3 a5 27.h4 b4 28.h5 Be8 29.Rhf1 Bb5 30.Rg1 bxa3 31.bxa3 Rf2+ 32.Kc1 Ba4, White resigns. 14.Ne5 Bxe5 15.dxe5 h5 16.Nb3 Ng6 17.Na5 Ne7 18.f3 Bf5 19.Bxf5 Nxf5 20.Nc6+ bxc6 21.bxc6 Qc8 22.Rab1+ Ka8 23.Rb7 Qxb7 24.cxb7+ Kb8 25.Qd7 Nh6 26.Qxd5 Rd8 27.Qb3 Rd3 28.Bc1 Nf5 29.Qc4 Rhd8 30.a4 g6 31.a5 Kxb7 32.Qb5+ Ka8 33.Qc6+ Kb8 34.a6 Kc8 35.Qb7+ Kd7 36.Qb5+ Kc8 37.Qb7+ Kd7 38.Qxa7 Ke8 39.Qb7 R3d5 40.Ba3 Ne7 41.a7 Ra5 42.Bxe7 Kxe7 43.Qb4+ Rc5 44.Ra1 Ra8 45.Qb7, Black resigns. 11.hxg6 fxg6 12.Rxh7 Nc5 13.Bxg6 Rf5 14.Qh5 Be6 15.Bxf5 Qe8 16.Rxg7+ Kxg7 17.Nxe6+ Nxe6 18.Qh7+ Kf8 19.Bxe6 dxc3 20.Qg8#.